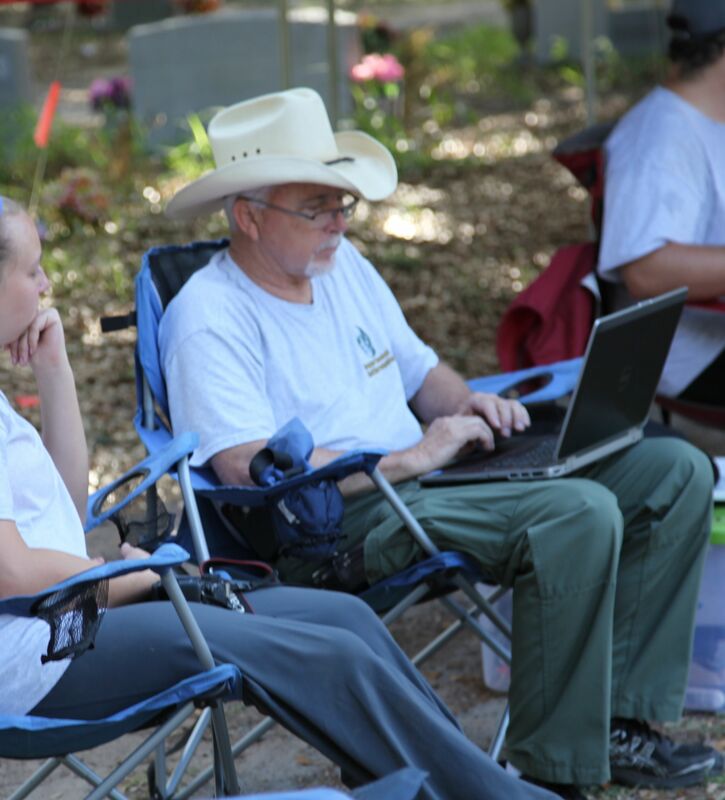 Sacred Heart Cemetery, Falfurrias: Dr. Lori Baker and Dr. Krista Latham engage students in the exhumation of unknown migrants’ remains through demonstration and guidance. See related story. 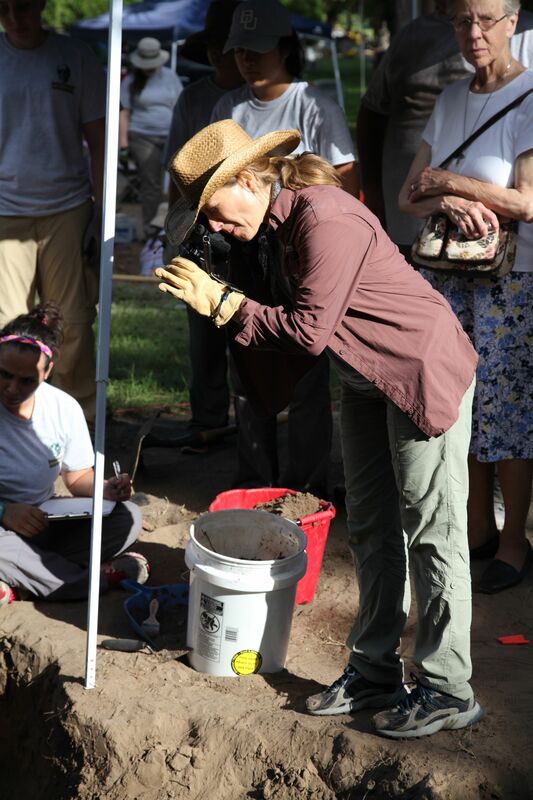 June 3, 2014: Dr. Lori Baker demonstrates the procedure from the point where the remains have been located to storing and preparing them for transport. Dr. Latham worked indefatigably as an expert forensic anthropologist. Dr. Corinne Stern’s lab and office overlooks a scenic view of a scaled down brush country typical of the topography of South Texas on the outskirts of Laredo in Webb County. The building is about a mile from the main road, next to the volunteer Fire Department on a dirt road. The drab, neat building in the style of old Mexico serves as the destination of migrants’ corpses found in Brooks County (see South Texas map). They had traveled by foot for miles, having crossed the Mexico-Texas border from various starting points including Mexico and Central America. Dr. Stern’s “patients” met their fate from “natural” causes, for example, dehydration, heat stroke, and snake bites. In the case of many migrants whose bodies were recovered from the Rio Grande River in Webb County, the cause of death was drowning. In this part of the river, the water is deep and its currents strong, making the crossings more perilous than further south. Let the Dead Teach the Living. Dr. Stern’s job is to examine the corpses’ identifiable markings and any other pieces of artifacts (clothing, for example) in their possessions that would help in the identification process. Sometimes, valuable information is hidden underneath the soles of the shoes, or in secret cavity in leather belts. 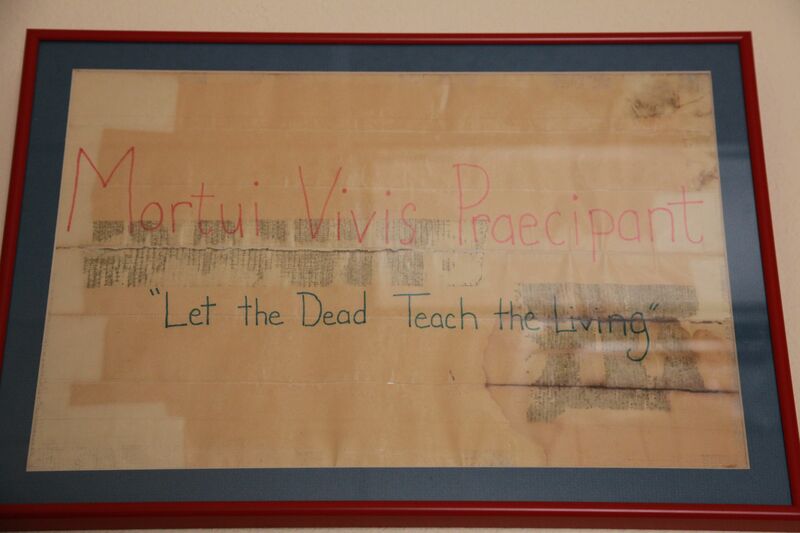 She meticulously examines every inch of the subject, holding true to her professional standards as evident in a Latin phrase written on an old piece of paper, framed, hanging in her office: Mortui Vivis Praecipant (“Let the Dead Teach the Living”). She brought the sign from New Orleans, while working there as an Examiner in the Reserves, right after Katrina hurricane plagued the city. The information is entered in the “Missing Migrants” binder, which is used to corroborate data from other sources, mainly family members searching for their loved ones. If there is a probable match between the corpse and the family member, DNA samples are collected thus facilitating the identification process. Even so, all corpses’ DNA samples are collected eventually. Unclaimed bodies are held in the Lab’s morgue for 60 days before transferred to a funeral service for burial. Data collected on each client. Dr. Stern’s office receives numerous calls from family members asking for any information that would lead to the whereabouts of their loved ones. The Mexican Consulate in Laredo also receives inquiry calls. 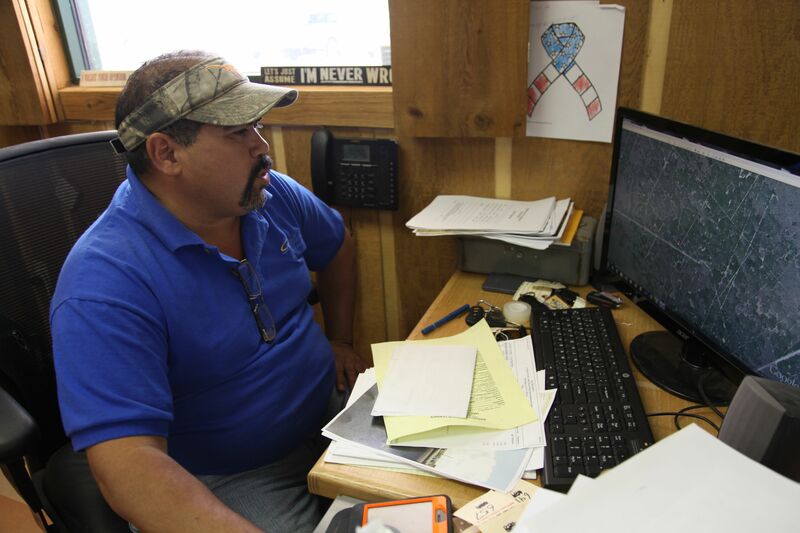 In Brooks County, the Sheriff’s office assists in the identification of missing migrants, but their scope of assistance is extremely limited due to lack of resources. 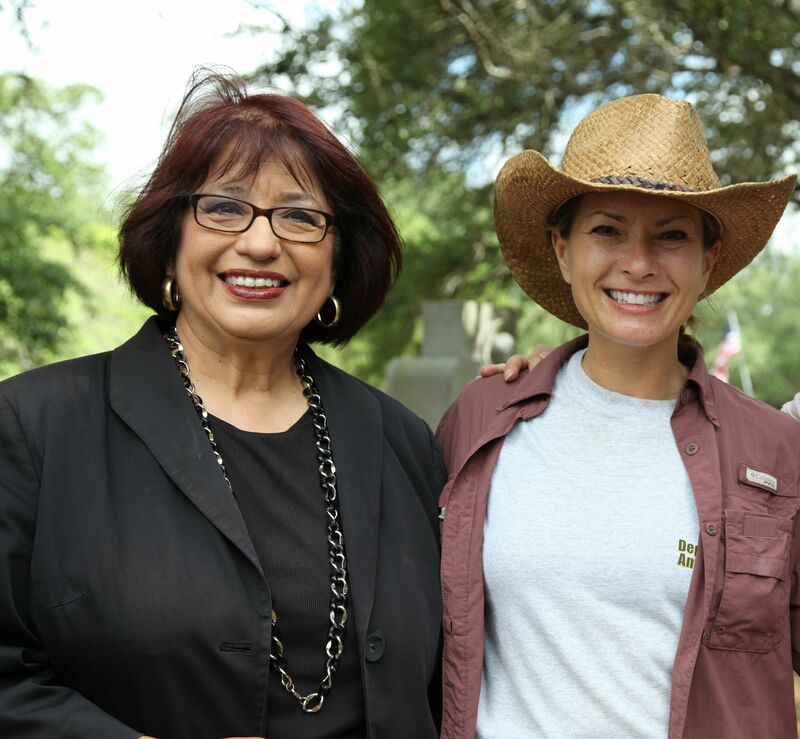 Before contracting with Dr. Stern’s Office in August, 2013, Brooks County officials transported the corpses found within their boundaries to Elizondo Mortuary in Mission, TX. Unclaimed corpses were buried in the Falfurria’s cemetery (see photo gallery). 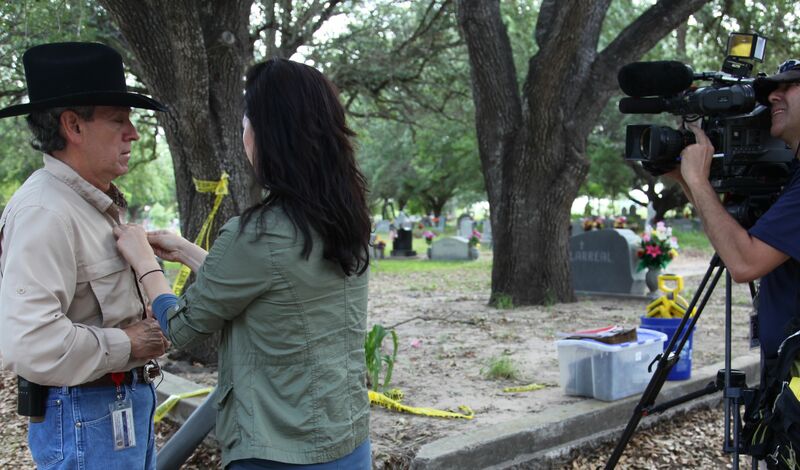 Both Texas State University in San Marcos and Baylor University in Waco have lent their assistance and resources: the Baylor team has thus far exhumed 62 of the approximately 130 unknown or unclaimed corpses from the Falfurias cemetery, and transported these to Texas State where they are stored and processed for identification purposes. Corpses that are decomposed down to their skeletal remains are transported to Forensic Anthropologist, Dr. Harrell Gil-King at the University of North Texas in Denton. Dr. Gil-King’s analysis serves to further identify the remains. All information collected from various sources is entered into a national database, the United States Justice Department’s the National Missing and Unidentified Persons System. The search and identification process is particularly complicated by the fact that many of the loved ones’ families live outside of the United States. 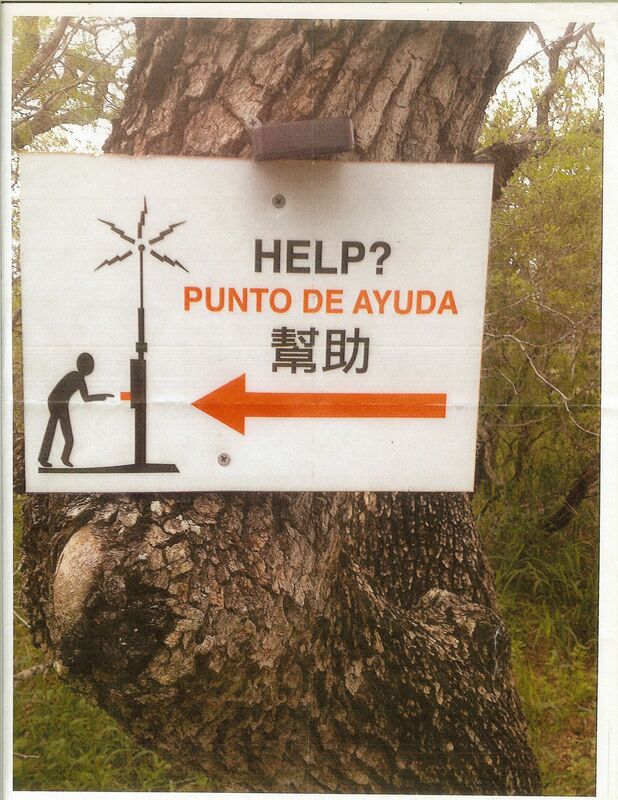 The consulate offices are helpful to a certain extent. However, the migration factors have changed in the last decade or two. There are as many border crossers or more from Central America as there are from Mexico. Texas is now the leading border state with the most migrant deaths (see related article), yet the resources are unequally distributed, leaving offices such as the Brooks County Sheriff with very limited means by which to assist in the identification process. The South Texas Human Rights Center has as one of its main goals to facilitate County officials in their work with migrant deaths. 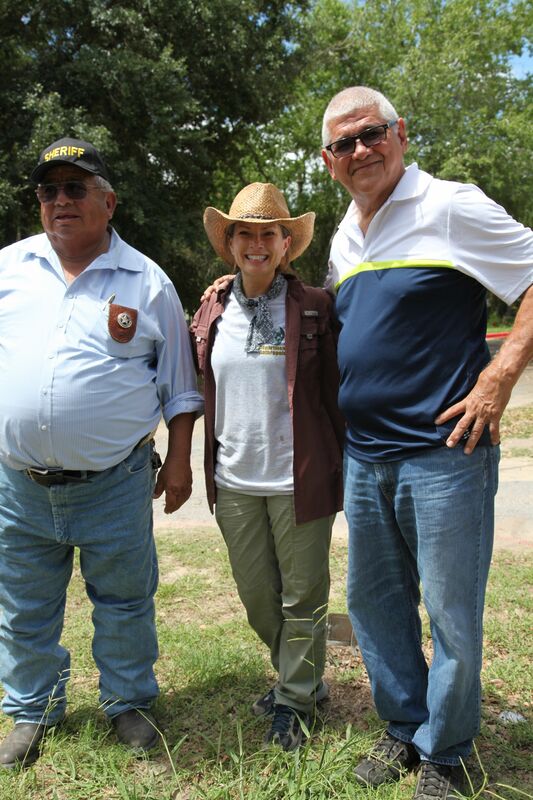 In addition STHRC has worked with the Border Patrol and ranch owners in installing 21 water stations in an effort to prevent deaths among border crossers due to dehydration. The STHRC headquarters in Falfurrias, coordinated by Mr. Eduardo Canales, works with the local community as well as the national and international agencies to provide assistance in assuring that the rights of migrants are respected and protected. Contact Mr. Canales at (361) 946-5252. Filmmakers filming Dr. Stern’s demonstration: John Carlos Frey and Matthew Campanela. Clothing: Careful examination yields information. Mary Wickstrom, Assistant to Dr. Stern. José Fernando Torres speaks from his heart. His wife has been missing for 20 months. 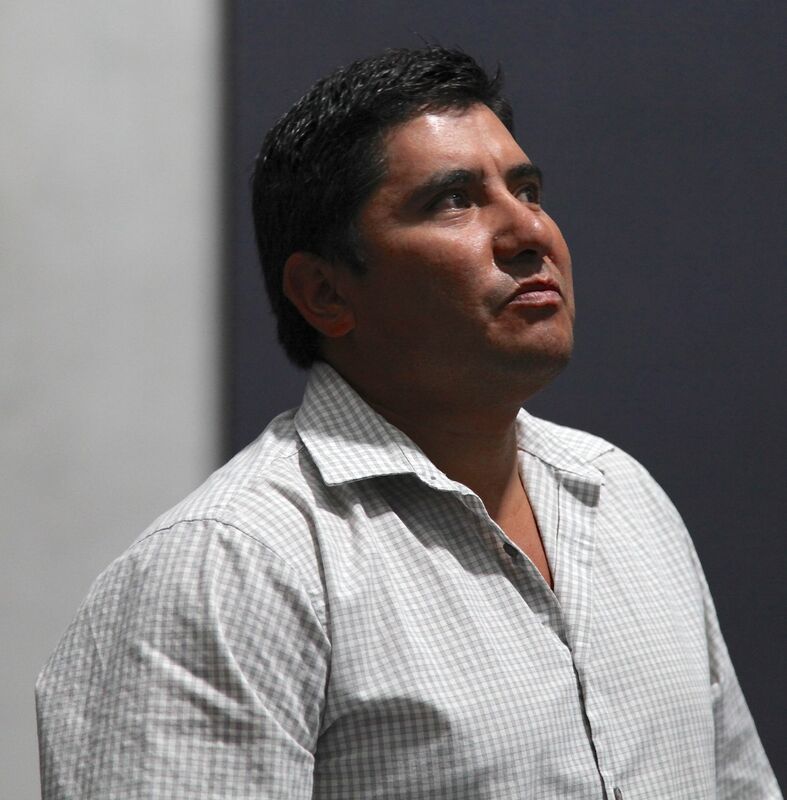 Rothko Chapel, Houston, TX – José Fernando Torres led the reading of the names of the dead or missing migrants during a solemn ceremony at the non-denominational Rothko Chapel on Saturday, November 2nd. But Torres didn’t read the name of his wife who has been missing for 20 months. Instead he offered a plea of hope that she would return home to their two young children. She was last heard from when trekking through the harsh South Texas area, near one of the ranch houses. But, she suddenly disappeared as if the earth swallowed her. A total of 29 participants read the 200 names; five at a time. After the reading, the group assembled in the outdoor patio, eating and drinking the traditional Día de los Muertos hot chocolate and sweet bread. A small basket served to collect a donation of $120, which will aid in the efforts of the South Texas Human Rights Center to prevent migrant deaths. The South Texas Human Rights Center gratefully acknowledges the staff members of the Rothko Chapel who made the special ceremony possible. We are very appreciative of their kind and generous assistance. Please see the photo gallery slideshow of the readers and other participants. Falfurrias, TX – Brooks County is situated in the center of the 13-county area identified by the South Texas Human Rights Organization as the hotspot for migrant deaths. Falfurrias, the largest town in the county is a headquarters for the Border Patrol and the County’s Sheriff’s Office, plus a privately operated detention center. Thus far, in 2013, 80 migrant deaths have been reported in Brooks County, in an area comprised of private ranch lands about 956 square miles. Within a 12-month period, 3,100 juvenile migrants were “captured” and apprehended as they trekked through the South Texas dry, harsh brush terrain from the Mexico/Texas border. About 63 “walkers” or individuals carrying backpacks, turned over 12, 000 pounds of marihuana to Border Patrol officials. In a 2-day period, 1,000 pounds of marihuana were confiscated. Their activity log also includes hundreds of “rescue” missions, although their primary purpose is to capture and apprehend migrants for illegal entry into the United States. 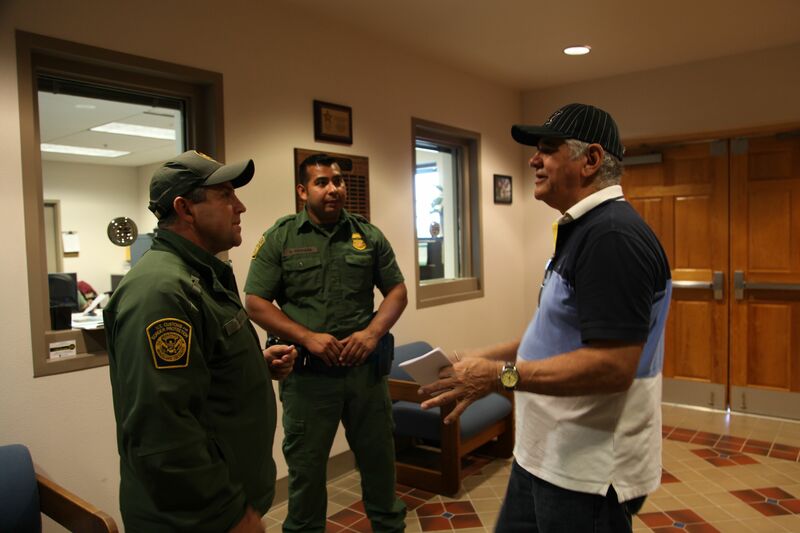 But, the cooperation and the coordinated efforts between the Border Patrol and the Sheriff’s department have not been without immense challenges. 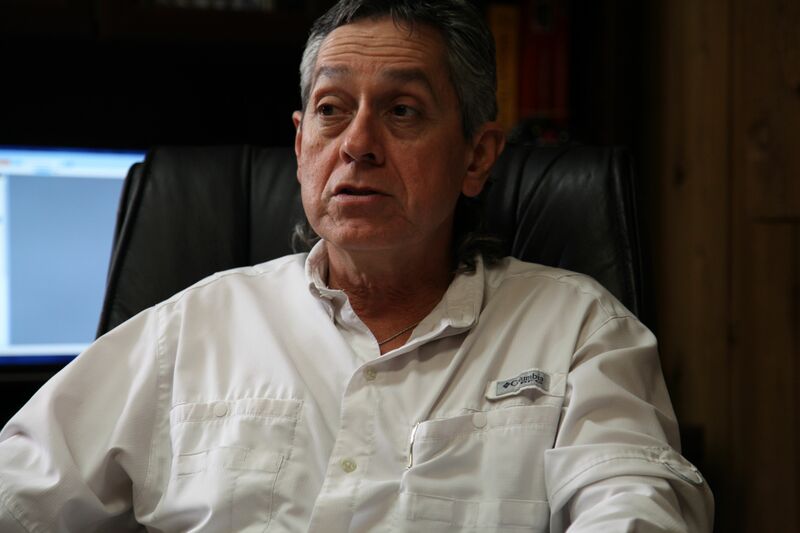 According to Chief Deputy Urbino (Benny) Martínez, the overwhelming issues or problems in working with undocumented migrants is particularly strenuous due to the lack of resources in their department. Thus, the need to work out a close partnership plan with the Border Patrol, much of which is navigated through uncharted areas of procedures, legal matters, and protocol. This is not an easy feat by any means, according to Martínez. Sheriff Rey Rodriguez heads the department with Benny Martinez as Chief Deputy. About 40 staff members have various roles and responsibilities within the department, including the county jail. Their tight budget is a source of frustration since they must address local or domestic problems as well as those associated with the migrant influx. Although burdened with a proportionately large number of migrants, Brooks County is not a “border county,” thus, is not eligible for specific additional funding, like Cameron County, for instance, that reported seven deaths last year. Some reports of migrants that appear dead or ill are called in by Homeland Security agents aboard helicopters pursuing migrants on the run. But most of the migrant corpses are found by the ranch owners or their workers, usually precariously. Sometimes they’re drawn to particular sites such as the pathways often used by the migrants, or by a flock of scavenging birds circling above their target. Ranch owners are reluctant to allow just anyone in their property citing legal concerns in which they may be held liable for injuries or deaths. (Read about a related case, Rodriguez v. Boerjan.) Federal and county officials are obligated to inform ranch owners of their presence in their property before they’re allowed into the property. When migrant deaths are discovered both the Border Patrol and the Sheriff’s Department are summoned to the deceased person(s). However, the Sheriff has the major responsibility for processing the corpses or their remains. Just recently, Brooks County established a policy whereby unclaimed remains of presumed migrants are sent to the Webb County Examiner’s Office in Laredo. 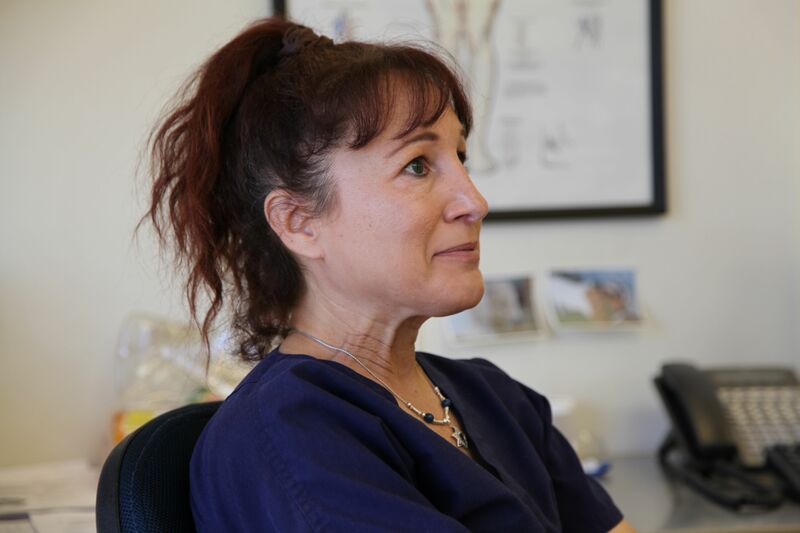 Dr. Stern, the medical examiner, conducts identification tests, including DNA assessments that may assist the Sheriff’s Department in locating the decease’ family members or friends. The remains are transported back to Brooks County where they are temporarily stored in a designated area in the Howard Williams Funeral Home. The Sheriff relies on particular invaluable institutional resources to facilitate in the corpses’ identification process. For instance, Baylor University, a private institution in Waco, Texas, has offered to conduct forensic analysis on skeletal remains. 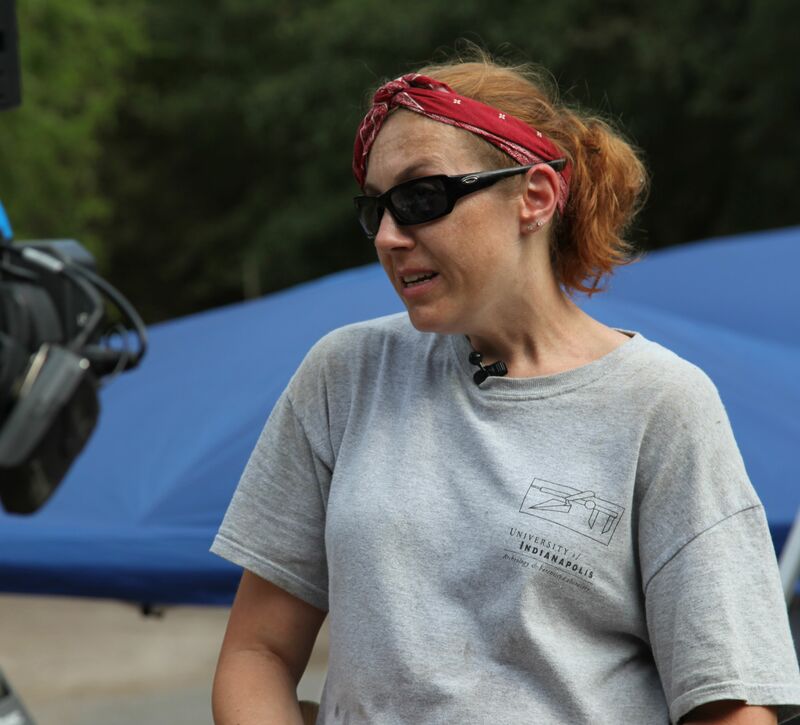 Professor Baker, a forensic anthropologist, engages her students in conducting on-site analysis, and provides an exceptional service to Brooks County without adding to their financial burden. 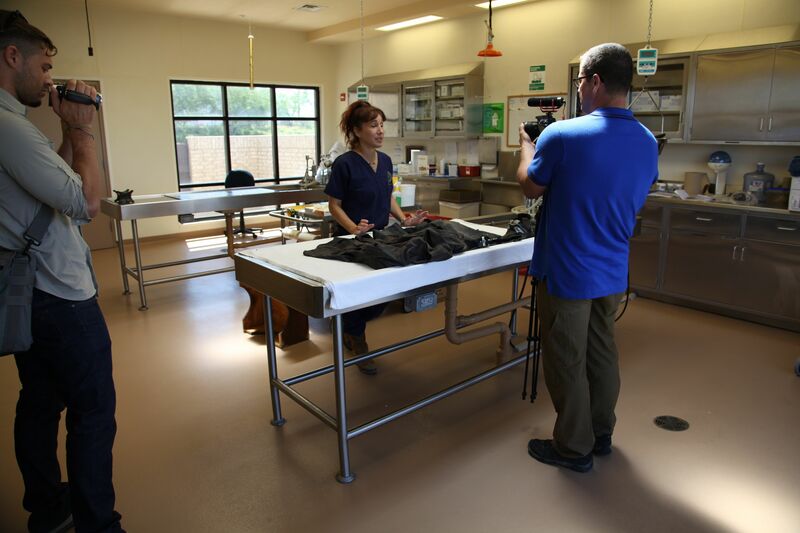 Another important resource is Texas State University in San Marcos, which provides a “body farm” facility to process and store unclaimed corpses that have been exhumed from the cemetery in Falfurrias. (See photo gallery this site.) Thus far, only half of the hundred or so corpses in the cemetery have been exhumed and processed for identification purposes. Perhaps, the most challenging task for the Brooks County’s Sheriff is to identify the corpses and notify their loved ones. Of the 80 corpses collected this year, only half have been identified. The Sheriff’s office maintains the records of the deceased, however, since their resources are limited their efforts fall short in matching the identified corpses with the National Missing and Unidentified Persons System. The identification process is hampered by the fact that many of the migrant victims are from Central America and Mexico and family or friends are unfamiliar with the system or process in order to locate their missing loved ones. 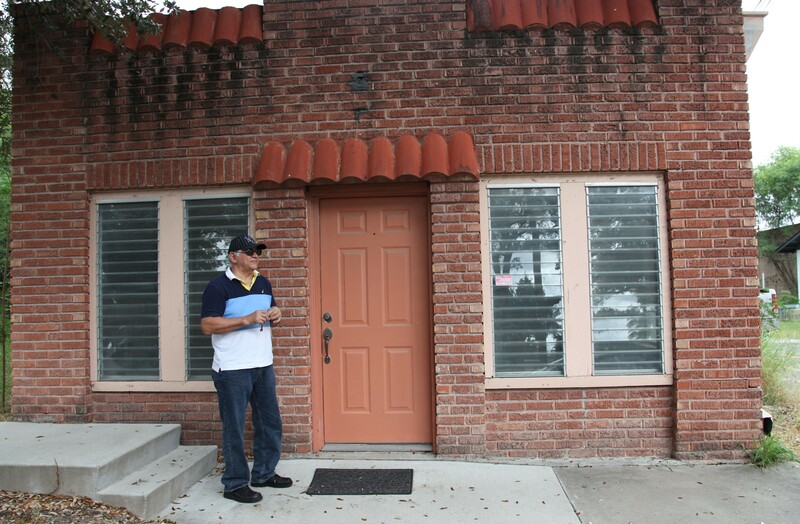 Eduardo Canales in front of the STHRC office. The Center’s main office in Falfurrias is across from the Courthouse. According to Eduardo Canales, the Center’s coordinator, an important goal is to coordinate services and activities with the county and local communities. Besides serving as a key source of information and as a communication hub, the Center will coordinate efforts with the County and Homeland Security to prevent migrant deaths and assist in the process of identifying corpses of the deceased and notifying the next of kin. The public is invited to attend a ceremony that includes reading the names of the fallen and remembering the unidentified. The ceremony appreciates those engaged in the ongoing struggles to promote human rights on both sides of the border. Please go to Rothko Chapel site to RSVP. In light of recent reports on the escalating deaths of migrants in South Texas’ brush country, efforts have begun to address the myriad of issues regarding the tragic circumstances. Investigative reporter Mark Collette addressed some of the most pressing problems in the Corpus Christi Caller-Times in a special section on Immigration. Some of the newspaper article’s important information is described below. 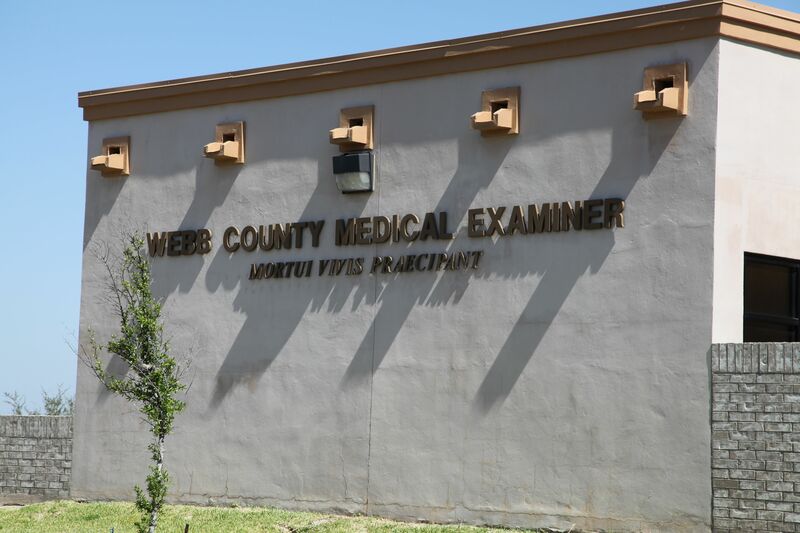 Very recently, Brooks County, which has the most reported migrant deaths, implemented a new policy of sending the body remains to the Webb County Medical Examiner in Laredo in charge of performing autopsies. However, other surrounding counties have different ways of handling and processing unidentified corpses. The Border Patrol has been an important source of information for compiling the number of confirmed deaths and approximate locations of where the remains were found. However, since the remains are found in private lands, Border Patrol officials are unlikely to divulge the exact locations. The following map shows the four ranches in Brooks County where the most deaths occurred within the last couple of years (2011-2013): Laborcitas, Mariposa, Cage, and King. 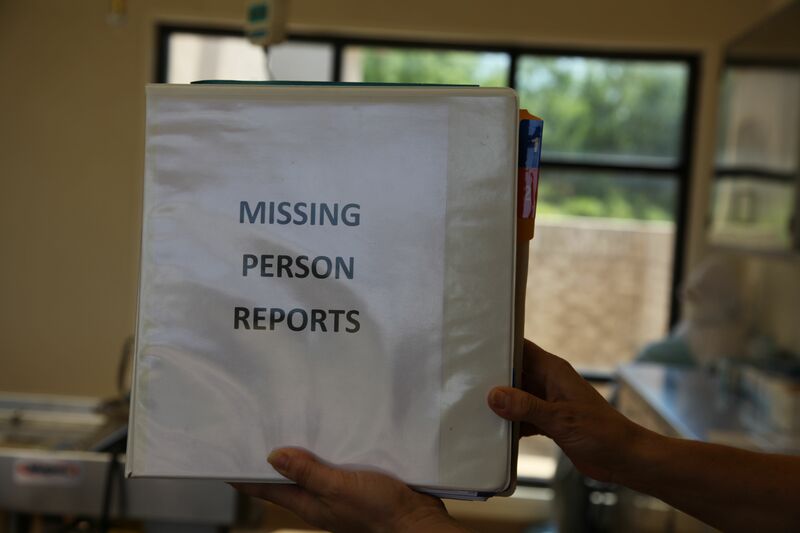 The families or friends of the “missing” or “disappeared” are often unfamiliar with the process for reporting missing persons. The Corpus Christi Caller-times lists the following contacts where the identifiable information on the missing persons can be registered. NamUS provides free DNA testing and other forensic services, such as anthropology and odontology assistance. NamUs’ Missing Persons Database and Unidentified Persons Database are now available in Spanish. 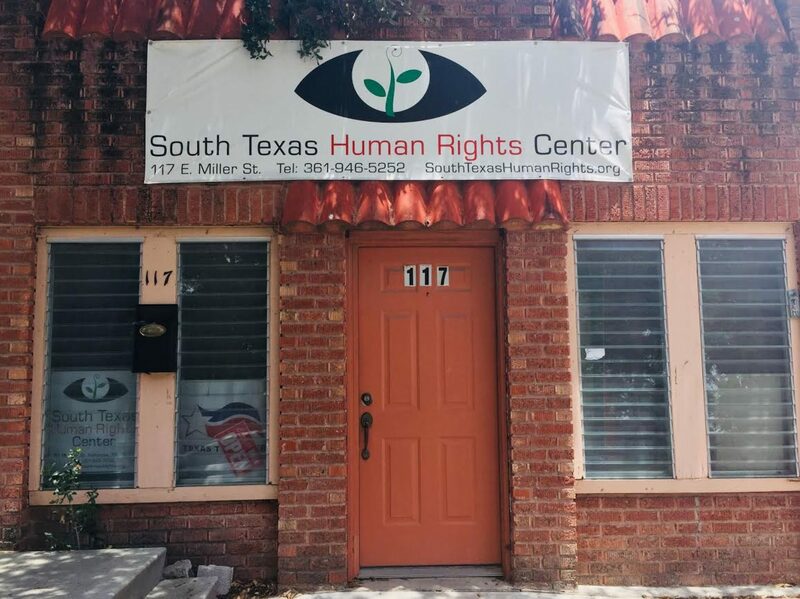 The South Texas Human Rights Center has its mission to end death and suffering in South Texas, along the Texas/México border. The Center is staffed by volunteers and operated with charitable donations. The Center accepts charitable donation through this website.